I missed one of Saturday's new beers. 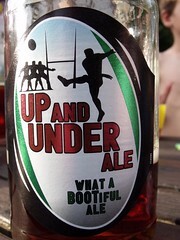 I do not think it mentioned Shepherd Neame on the bottle but I am assured that's who brews it. 4.0% deep amber colour with a good head, the aroma and taste is all dark chocolate. My review is totally different from all the other reviews I have looked at, nobody else seemed to taste chocolate. The title is not aimed Jonny Wilkinson, he is still the best in the world.